UNIVERSITY OF RICHMOND, Va. – The Spider Swim & Dive team shined in the team’s Senior Day meet with Campbell. The Spiders won eight individual events including four from seniors. The Spiders won the meet 155-124. Senior Annie Lane picked up a pair of wins in the 1,000 free (10:34.99) and the 100 breast stroke (1:06.32). Just behind Lane in the 100 breast stroke was classmate Erin Barry who took second at 1:07.20. Senior Hannah Verrette won the 100 back in a time of 57.21 with freshman Ellie Ronan close behind at 58.84. In addition to her second place finish in the 100 breast stroke, Barry won the 200 breast stroke in a time of 2:22.18. Sophomore Hannah Gouger and junior Nicole Piercy finished first and second in the 200 free at 1:55.04 and 1:55.34, respectively. Gouger also took the top spot in the 200 back stroke (2:00.68) with Verrette in second (2:03.83). The Spiders swept the 500 free with sophomore Virginia Marsh leading the way at 5:04.55. Piercy (5:09.55) and junior Lauren Wallace (5:11.93) came in second and third, respectively. Richmond also took the top-three spots in the 200IM with junior Morgan Soulia leading the Spiders as she touched at 2:06.99. In the relays, Richmond won the 200 free in a time of 1:36.40 and was second in the 200 medley at 1:48.01. Richmond has won 15 of the last 16 A-10 titles and will return to action on Wednesday, February 14 looking to defend its title. The championship returns to the SPIRE Institute in Geneva, Ohio from February 14-17. More information about the meet will be here on RichmondSpiders.com and fans can follow the team on Twitter and Instagram (@SpiderSwimDive) for additional coverage. 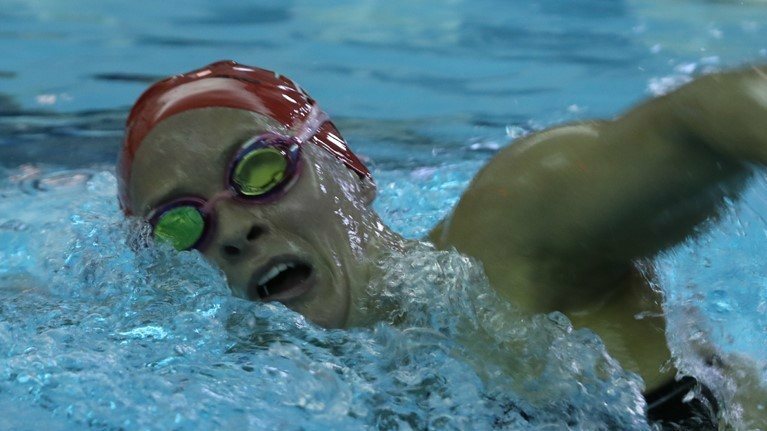 RICHMOND, VA. – The Fighting Camels claimed five events against the Richmond Spiders Saturday afternoon at the Robins Center Natatorium, highlighted by two individual wins each from Caroline Clark and Sarah Wilson. Richmond claimed the overall dual meet, 155-124. Campbell (4-10) opened the meet with a victory in the 200 Medley Relay. CU’s group of Megan Everritt, Taylor McMinn, Clark and Michelle Case finished with a time of 1:47.99 to place first in the event. Clark tallied Campbell’s first individual event title of the afternoon with a first-place outing in the 200 Fly, posting a mark of 2:07.35 to claim nine points for the Camels. She also won the 100 Fly with a 57.12 performance, just two seconds off her PR that is also a school record. Wilson dominated the freestyle sprinting events, claiming victories in the 50 and 100 Free with times of 24.49 and 53.42, respectively. The Camels also totaled seven runner-up finishes at the meet. Geena Squartino completed the 1000 Free with a time of 10:45.64 to place second, followed by Madison Scott who finished runner-up in the 200 Fly behind Clark with a 2:08.55 performance. McMinn took second place in the 200 Breast, clocking a time of 2:27.02. Maddie Baiottoearned a silver finish in the 100 Fly with a mark of 58.08. Kelsey Tunstall was Campbell’s final individual runner-up finisher with a mark of 2:11.03 in the 200 IM. The Camels closed the afternoon with a second-place finish in the 200 Free Relay, as Hannah Kendall, Maddie Heggie, Wilson and Sindija Silina notched a collective mark of 1:36.55. This marks the end of the regular season for the Campbell swimming program. Up next, the Camels will travel to Athens, Ga. for the CCSA Championships, hosted by the University of Georgia from Feb. 14-17.